Visit Stratford-upon-Avon introduces you to a market town with more than 800 years of history, containing not only many buildings that survive today and would have been familiar to Shakespeare, but also a thriving community offering a wide variety of leisure, accommodation and shopping experiences. So take a moment to have a look around the site! Time to stroll around this Shakespearian Town. The birthplace of William Shakespeare, steeped in culture and historytory. Set in the beautiful rural Warwickshire countryside, on the banks of the river Avon, it is one of the most important tourist destinations in the UK. A relaxing sightseeing cruise experience is the tranquil way to discover Shakespeare Country. Bancroft Cruisers friendly onboard guides are renowned for bringing the past to life  engaging passengers of all ages with their encyclopaedic and unusual knowledge of local history. 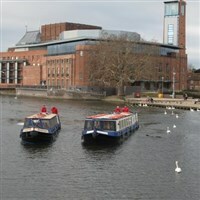 Cruises last 45 minutes and depart from the landing stage at the Holiday Inn Stratford-upon-Avon.